Boat International has teamed up with the J Class Association to become its official media partner. The agreement will see Boat International work closely with the J Class Association to celebrate these historic yachts, their enterprising owners and their stories. 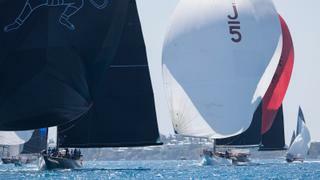 Fresh from their appearance in Bermuda during the recent America’s Cup Superyacht Regatta, the Js will now head to Newport for the upcoming J Class World Championship, which is due to run from August 21-26. The crews of Velsheda and Hanuman will be looking to get one over on Lionheart, as the 43.4 metre Claasen-built sailing yacht took top honours in Bermuda with two wins from five races. Nine J Class yachts are currently on the water and the fleet has never been stronger — 43.6 metre Svea is both the newest and largest, launched by Dutch yard Vitters earlier this year. At the other end of the scale, Shamrock V is the earliest example of a J Class yacht, having been built in 1929 by Camper & Nicholsons. And with designs for two further J Class yachts also surviving to this day, there’s every chance that this historic fleet could be growing even larger in the future.